In this activity of SHC Task 53, a detailed description of typical conventional reference system is delivered. Market dominating small scale system types (< 10 kW) for air-conditioning, cooling and heating for rooms are investigated and identified reference systems apply the mechanical compression method to treat the working fluid. The reference system respect different European climate zones and with displaying and discussing the simulation results of a parametric study, the energy performance of the defined reference system is shown as a function of the room type and of the climate condition of the selected European Cities. The A2 activity is dedicated to building the state-of-the-art for new cooling and heating system configurations according to market available and close to market solutions (R&D level just before or during demo stage) at the start of SHC Task 53). This state-of-the-art is based on results from surveying SHC Task 53 participants, and no claim can be made for completeness. The survey results for both solar thermal and solar PV solutions are classified according different criteria: size, applications, etc. 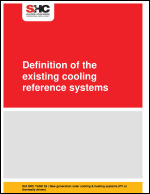 The present report has been built so as to make a picture of the existing and future systems called “New Generation Solar Cooling and Heating Systems” and try to understand their main features. This picture cannot be completed but this can give an interesting fore view of this new generation. This survey is not including refrigeration systems. The solutions are all pre-engineered systems with small to medium capacities for the following building types: single family houses, small multi-family buildings, offices, shops, commercial centres, factories, hotels. All of these buildings can be grid connected or off grid in case of PV cooling and heating. The cooling and heating power range will be from 1 kWcooling/heating to several tens of kWcooling/heating. The majority of the presented solutions can be driven by solar thermal or/and solar photovoltaic energy, which means these are all solar cooling solutions. 10 solutions are described in a summary set of tables giving technical comparative details as well as some economic indications (overall average end user price for instance) and a comparative square view of the principle scheme is presented. Additional details and pictures can be found in the Annex.